Not your typical chicken satay! Skewered crispy, flavourful chicken satay grilled over a fire, but in wings form! You have to admit, chicken wings on a stick seems a bit absurd doesn’t it? So why would I do it? Besides the fact that I was craving chicken wings (this happens on a weekly basis.) Skewering chicken wings also has some benefits as well! Why Would You Skewered Chicken Wings? That’s Absurd! There is a method to my madness, I swear. Skewering it stretches out the wings so they cook faster since they aren’t folded. If you cut your wings into sections, it’s less flipping! You flip the stick once, and it flips all 3 parts. If you did that separately that would be 3x as much flipping! Can I Use This Recipe for Other Food Things? You sure can! You can use this pretty much on anything! Hey! Where’s the Peanut Sauce? You can’t have chicken satay without the peanut sauce right? 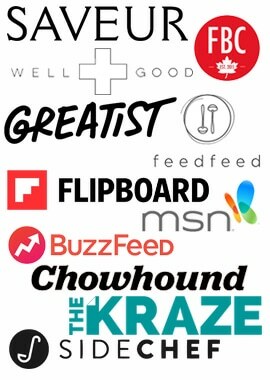 We got you covered! 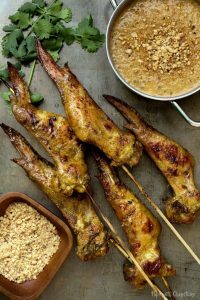 If you’re up for a flavourful peanut sauce with these skewered meat sticks then check our our “Satay Peanut Sauce” post! 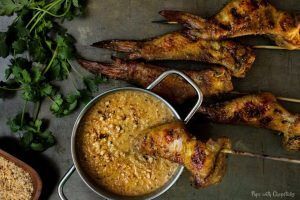 For this chicken satay recipe, most of the ingredients can be found at your local grocery store. Fresh lemongrass can be found at an Asian grocery store. Lemongrass can also be found in the frozen section as well. If you are using fresh lemongrass only use the white solid chunk at the bottom of the stalk. The drier looking stuff at the top won’t has as much oils and won’t have as much flavour. Roughly chop the shallots, lemongrass, garlic and shallots into small pieces and blitz it in a food processor. You can also finely chop these by hand if you don’t have a food processor. In a large bowl combine all the ingredients (except the wings) and mix into a marinade. Add the wings into marinade and marinate it for a mimimum of 4 hours. This will taste best if you marinate it overnight. If you are using bamboo skewers, soak the ends in a tall cup for an hour, this is to prevent the sticks from burning during grilling. No need to worry about the pointy part half since the chicken will be covering that bit. Add the chicken wings on to the grill and cook them for 20 – 25 minutes. Open up the grill (and keep it open so the temperature goes up) and apply the marinade on both side of the wings and let it cook for 5 minutes each side. To get that crispiness from the wings, brush on some oil and let the heat crisp up both sides. Tip #1 : Turmeric dyes skin and finger nails! If you don’t want discoloured skin or nails wear gloves before handling the marinated chicken satay. Not your typical chicken satay! 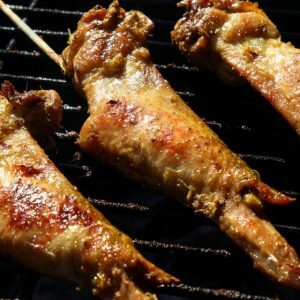 Crispy, flavourful satay chicken grilled over a fire, but in wings form! Turmeric dyes skin and finger nails! If you don’t want discoloured skin or nails wear gloves before handling the marinated chicken. I love the idea of using wings for the skewers. Your peanut sauce looks to die for. Thanks for posting! Very creative and delicious sounding! Love the presentation! Omg I *NEED* to try this with shrimp or salmon! Only because I’m pescetarian, otherwise I’d be all over eating this chicken just as you have it here. Because girl, it looks hella tantalizing. I actually love the idea of skewering the entire wing, skin and all. I bet it’s so juicy and tasty! Nice recipe. 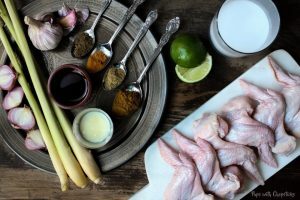 These ingredients sounds extraordinary stunning for marinating chicken wings. Now it’s the best summer time to cook this dish to entertain my friends. Yummies is served! 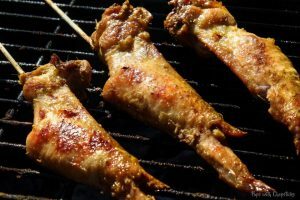 🙂 I like the idea of using skewers for the chicken wings so that it gets crispy everywhere and cooks faster! This looks so tasty. Great choices of spices and that peanut sauce looks so good too! Aw thanks Marie! 🙂 Nothing beats your yummies! We need to be neighbours! Awesome ida. I love all the spices. I will be making these this summer. Thanks for sharing. I really love this idea of using skewers for chicken wings…they look fantastic! Such a great idea to skewer the chicken wings! So many wonderful benefits to skewering the chicken wings! Definitely going to try this technique the next time we grill wings! These look perfect in every way and have me currently craving a plate of them! My husband has always been the grill master in our house, but because he works late hours now I have vowed to learn to grill this summer. This looks like a great recipe/technique to hone my skills! I was the same way! I was gifted a charcoal bbq and at the time I was living alone…so why let a perfectly good bbq go to waste right? To the googles for how to start a charcoal bbq! 🙂 Hopefully this post helps! These look so golden and tasty! Definitely worth the effort in my books! Dang, I knew this would be good! 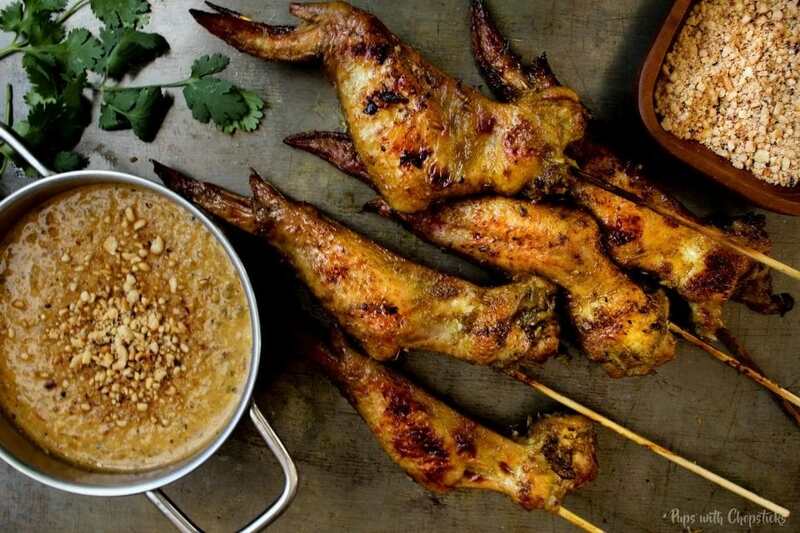 Using wings for satay is an absolute genius move, and that last shot is totally drool-worthy.